„Dystopie“ ist die zweite Einzelausstellung von Pablo Genoves in der Galerie MaxWeberSixFriedrich. Seine Arbeiten sind zurzeit ebenso in der St. Paul’s Cathedral in London zu sehen. In seinen Kompositionen beschwört Genoves den Clash von Natur und Kultur, der sich spätestens durch Hurrikan Katrina in das kollektive Gedächtnis eingebrannt hat. Er ist aber eher an dem Moment interessiert, bei dem das Unvermeidbare unausweichlich scheint, jedoch noch nicht eingetroffen ist und alles noch ruht – ein photographisch perfekter Moment, der bei einem realen Szenario sehr schwer festzuhalten wäre – in diesem Moment entfalten die Kulturkathedralen ihre Erhabenheit und Herrlichkeit. Die Kräfte der Natur wirken fast friedlich oder zumindest nicht entfesselt. Pablo Genoves (geboren 1959, in Madrid) lebt und arbeitet in Berlin. Seine Arbeiten wurden in Einzel- und Gruppenausstellungen in Museen und Galerien Europa, Chile, Peru, Brazil, den Philippinen, Korea und den USA gezeigt und sind in vielen öffentlichen und privaten Sammlungen vertreten. 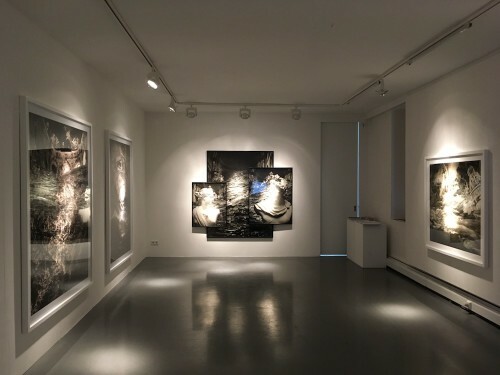 This is Pablo Genoves’ second solo exhibition at MaxWeberSixFriedrich – whose work is currently also on display at the St. Paul’s Cathedral in London. In his compositions Genoves evokes the clash of nature and culture. At the very latest since Hurricane Katrina the results of such a catastrophe are still in the collective memory but Genoves is rather interested in the very moment where that devastating impact seems inevitable but hasn’t happen yet – a very photographic moment which would barely be recordable, in spite of the impending catastrophe. In that very moment men built architecture – which is deprived by its natural inhabitants – reveals its full beauty and grandeur, and forces of nature appear quiescent, or yet to be unleashed. The pictures of those cathedrals of culture are found images and Genoves stages that presumably destructive impact of the depicted motifs within the frames of picture itself. Yet, the outcome of the clash remains unknown, since the robustness of the architecture has to be taken into account. The homogenizing color filters he applies conceal these dystopias in an appealing way, soothing the irreconcilabilities of the counterparts. 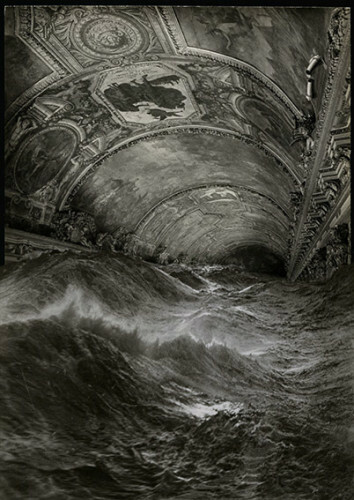 In this show Genoves will also present, for the first time, a triptych and a video work where he applies cinematic techniques on one of his finished compositions to dramatically animate the imminent event. Pablo Genoves (born 1959, Madrid) lives and works in Berlin. His work has also been exhibited, both in solo and group shows, in Europe, Chile, Peru, Brazil, the Philippines, Korea and the USA. His photographs form part of many international public and private collections.